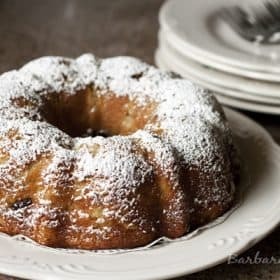 A rich, super moist bundt cake made with brown sugar, diced pears and dried cherries, then dressed up with a sprinkle of powdered sugar. I made a couple of small changes to the recipe. I didn’t have any buttermilk, so I substituted yogurt. 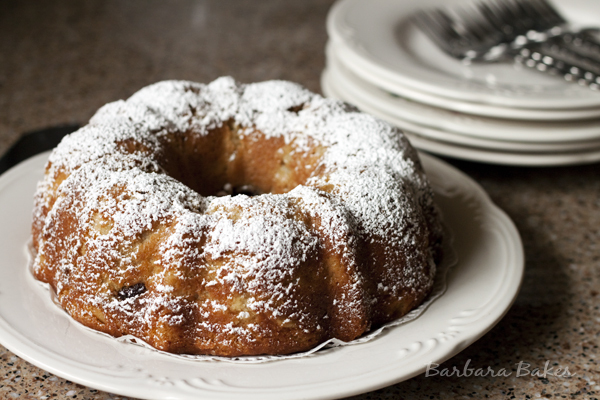 I love dried cherries in baked goods and they were a perfect substitute for the raisins. I also baked it in two half size bundt pans so I could serve one and freeze one for later. Its’ so great to have dessert stowed away in the freezer to serve if company drops by. I’m linking this post up to this month’s Monthly Mingle “Berries and Cherries” hosted by Chris at Mele Cotte. Center a rack in the oven and preheat the oven to 350º F. *Butter a 9- to 10-inch (12 cup) Bundt pan, dust the inside with flour and tap out the excess. If your pan is not nonstick, dust the interior of the pan with flour, then tap out the excess. (Don’t place the pan on a baking sheet – you want the oven’s heat to circulate through the Bundt’s inner tube.) *I use two half sized bundts sprayed with baking spray with flour. In a large mixing bowl, beat together butter and sugar at medium speed until light and fluffy, about 3 minutes. Add the eggs one at a time, beating for 1 minute after each addition. Beat in the vanilla. Reduce the mixer speed to low and add the flour mixture and the yogurt alternately – add the flour in 3 additions and the buttermilk in 2 (begin and end with the dry ingredients). Mix only until the ingredients are incorporated and scrape down the bowl as needed. With a rubber spatula, stir in the pears and cherries. Scrape the batter into the pan(s) and smooth the top with the spatula. Bake for 60 to 65 minutes, or until a thin knife inserted deep into the center of the cake comes out clean. (If the cake looks as if it’s browning too fast, cover the top loosely with a foil tent.) I baked the half size bundts for 35 minutes. Transfer the cake to a rack and cool for 10 minutes before unmolding, then cool to room temperature on the rack. When you are ready to serve, dust the top of the cake with confectioners’ sugar. I don’t think I would have thought to combine cherries and pears, but it sounds absolutely delicious! Love this! We absolutely love your blog and find many of your post’s to be just what I’m looking for. Does one offer guest writers to write content available for you? I wouldn’t mind composing a post or elaborating on a few of the subjects you write in relation to here. Again, awesome web log!My spouse and I stumbled over here by a different web address and thought I may as well check things out. I like what I see so now i am following you. Look forward to exploring your web page yet again.Our question to posting an article, how do you convey your thoughts into a post? Thanks for any reply. Your writing is humbley appreciated. I have this cookbook too and dont bake enough from it. That’s a strong recommendation coming from the TWD folks, I’ll have to try this recipe too! Barbara, saw the title of the recipe and HAD to come and gawk! Gorgeous! I’ve been wondering what to bake today and this looks so perfect! You never fail to inspire me, baking-wise – WISH I were half as talented as you at baking. But then again, I’d weigh 300 pounds!!! Wow, I’m sure the marriage between the pear and cherries creates an amazing combination. 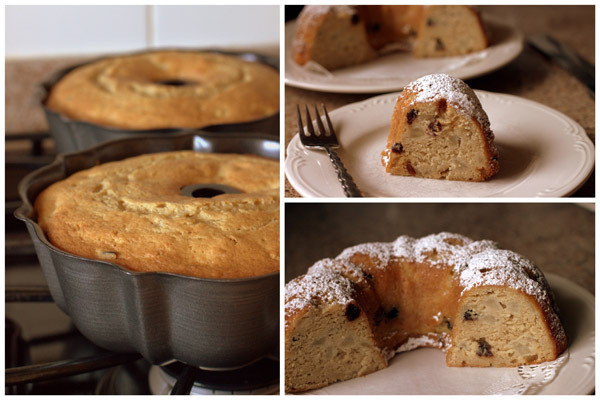 I should get some half-sized bundt pans too so I can save some in the freezer! That looks delish!! So moist – am almost drooling here. This would be perfect for a dinner party! it looks SO moist, i love it, perfect for tea time!